The Brooklyn Public Library is seeking outgoing volunteers to bring smiles to sick kids. Sign up to read books aloud distribute FREE children’s books in pediatric clinics and hospitals in Brooklyn. It’s called the Reading Troubadour program, and we’re singing its praises. It’s a perfect program for a Grammie or Pop-pop whose grandkids live too far away to read to them, or whose grandkids live down the block but they have outgrown story time and you miss reading to them. Volunteers for the Reading Troubadour program pledge to support child literacy by visiting Brooklyn clinics twice a month for two hours each visit, where they read aloud to kids and parents waiting to see the doctor, and also hand out age-appropriate free books to take home. Even adults up to 20-years-old can take home a free book, to encourage young mothers to read aloud to their own young children, their kid brothers or sisters, or kid nieces or nephews. Certainly you have four hours a month to contribute to help reduce the stress of waiting to see the doctor, and make a positive impact on a sick child’s future literacy. The program is designed to support childhood literacy by encouraging parents to read to their children — something that makes all the difference when it comes to learning those ABCs. Anyone interested in volunteering to be a Reading Troubadour can call Brooklyn Public Library at (718) 230–2406, or complete an online volunteer application by going to misc.brooklynpubliclibrary.org/volunteer. 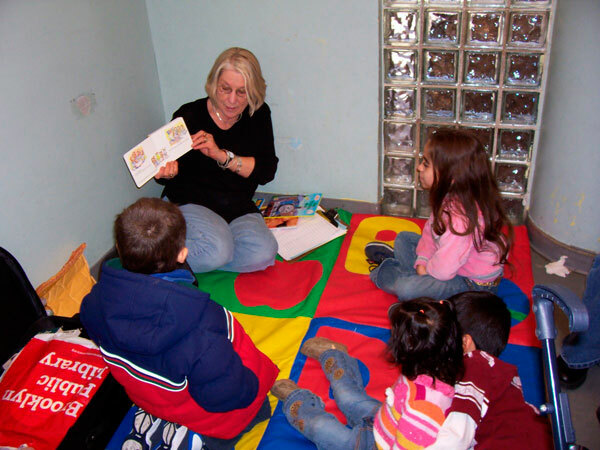 Volunteer Carol Beemer reads a picture book to kids as part of Brooklyn Public Library’s Reading Troubadour program, which provides children with free books and readings in an effort to encourage literacy. This photo appeared originally in the Brooklyn Paper.